I finally did it! 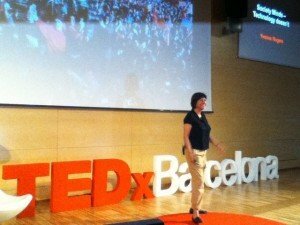 I walked onto a spot lit stage, with big polystyrene red and white TEDx Barcelona letters behind me and a red carpet underneath me, and delivered my talk. It was not really a talk, though. It was a performance. Emerging from the darkness to a keenly awaiting audience with headlight eyes. There is an enormous adrenalin release and the race against the 15-minute timer on the monitor begins. Go, go, go. How stand-up comedians manage this transition from hiding behind the curtains to a sudden light bulb flash experience, day-in day-out, I don’t know. But it is much more than managing stage fright; there is also having to deal with the roller coaster build up that precedes it. For starters, there is the humbling experience of being coached by a professional; the constant self doubt you are not up for it; the perpetual tweaking of the slides, the conjuring up of new lines you think might be funny and then realize are not and more. And then on the day, there is the final countdown shared with the other speakers; you each have your own look of fear and worry that rubs off on each other. 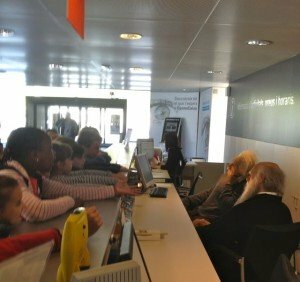 In our case, we had hours of A/V complications with non-english speaking technicians; foreign laptops that did not work in the way ours did, beautiful fonts lost in the process, rehearsals to an empty auditorium – and lots of visits to the bathroom. Then the show begins. Perched on my seat in the front row, I semi-listen to the other talks before mine, unconsciously, mentally rehearsing bits I had messed up during the rehearsal, especially phrases that did not flow. Last chance. And then all of a sudden it is my turn to be miked up and pushed from from behind the curtains. It all happens in a flash. And, it all comes together – except my one video clip does not play but somehow I smooth over it. I even manage to smile, gesture wildly and finish with a flourish. A wink and then a final thank you. I look up to a clapping audience. I can hear ringing in my ears. Then it is all over. I walk off and the organizers embrace me and apologize profusely about my video not playing. I don’t care at that point because it is all over. And then the next speaker is standing under the spotlight, looking up and talking in loud spanish about robots. I sit down and for a few moments just breathe very slowly and deeply. At the break, I steel myself to check if anyone has sent any congratulatory emails. A few have appeared in my mailbox, saying great talk, wonderful. I am mightily relieved, and the last of the adrenalin finally drains from my system. Our TED event had a mix of spanish and english speaking scientists and artists, talking about a diversity of things, from remote kissing machines to robots with a sense of self who fear humans. In the end, I played safe rather than be too soundbite-ish. I gave my talk a community spin rather than the ‘smart technologies make us dumb’ line, I had originally planned. Instead of retreating increasingly into our own digital bubbles why not think about how digital technology can be designed and used quite differently: to share, to galvanize, to collaborate and be mindful of others when being together. The post production version is now viewable online. I had not realized how much backwards and forwards striding I did as a result of being told to stay within the confines of the red carpet. Over dinner, later that night, some of my fellow speakers talked about how the TED formula is taking over from the old school academic lecture. We discussed whether we‘re becoming entertainers for short-attention spanned audiences. The idea of sitting for an hour listening to someone reading and deliberating a nuanced philosophical argument from their hand written notes seems a thing of the past. There is a piece online called ‘Against TED’ by Nathan Jurgenson, that I felt, perhaps, was a little too harsh and a tad too clever in its critique of modern day TED, starting with the gambit: “When did TED stop trying to collect smart people and instead collect people trying to be smart?” No matter what the cynics say about TED being ‘so yesterday’, and having lost its edge, it still is an amazing spectacle, especially for those who are speaking or attending such an event for the first time. And, perhaps the democratization of TED as it is today, with hundreds of TEDx events being held all over the world, every week, rings some truth to the weary Silicon Valley crowd who have seen it all before (and indeed when doing my homework watching several of the existing videos, I worried if there was anything new to say that had not been said before and more smartly). But just as Albert Einstein continues to inspire generations of children so, too, can TED talks. Billions have viewed the 1000s of online videos of the TED talks, that have been uploaded over the years since it was an exclusive club only for the smart, silicon-clad crowd. That is definitely an idea worth spreading. What will stay most with me about my big day actually had nothing to do with TED. 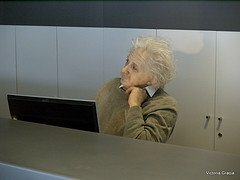 On first arriving at the CosmoCaxia Science Museum, where the TEDx Barcelona event was being held, I noticed a spot lit wax model of Albert Einstein sitting at the information desk in the foyer. For a split second you think he is real. The setting, the clothing, his hair, facial expression and pose are perfect. I watched as a group of excited school kids also noticed him for the first time and ran spontaneously in unison over to the desk from where they stood. They giggled and stared at him in awe, all reaching out as if to try and touch him. It was a moment to marvel at sharing their moment of joy. Whoever thought of that great idea had a stroke of genius in them.